THE BATTLE OF WATERLOO COMES TO YORK 23-24 MARCH. 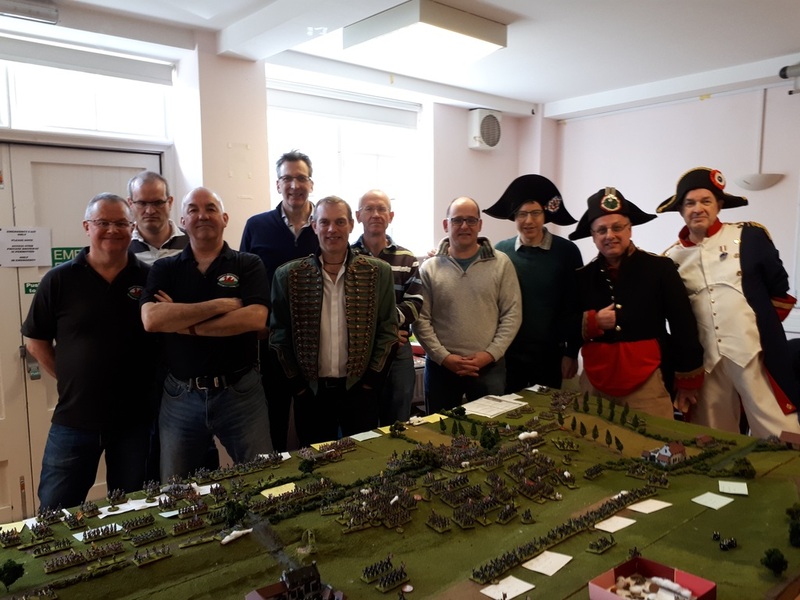 Everyone is invited to visit the Battle of Waterloo in miniature on Saturday 23 March and Sunday 24 March between 9am and 5pm at St Olaves Church Hall in Marygate Lane, York. Entry is free but the event is being held to raise funds to pay for children in Malawi to attend secondary school. 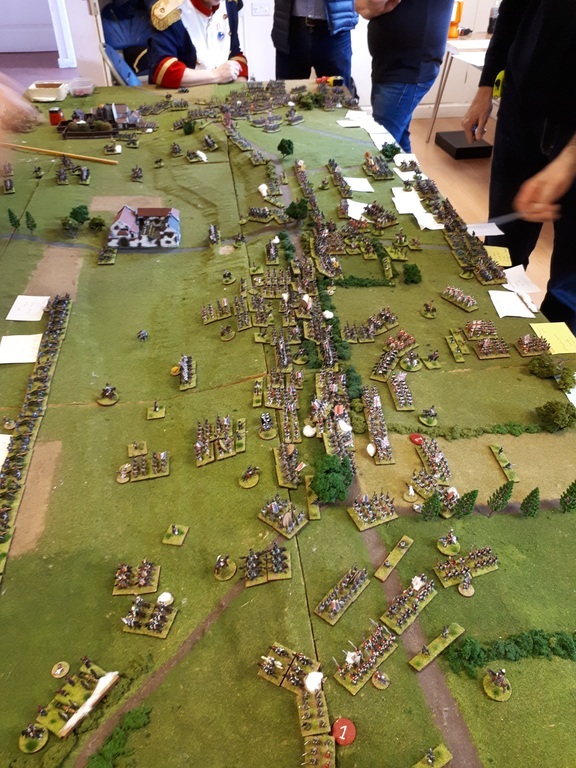 The Battle of Waterloo is being recreated using over 5000 15mm high painted figures which represent accurately every regiment that appeared on the battlefield for Britain, France and Prussia. The game is organised by Paul Dawson of York and Paul Johnston of Robin Hood's Bay. Eight other volunteers will also be playing and visitors are welcome to come and watch, and even join in by rolling some dice too! The battlefield is a purpose built replica of the real thing and measures 12 feet long and up to 12 feet wide. It costs just a pound a week to pay for a child to attend secondary school in Malawi but even this is beyond many families. The event hopes to raise £100.00 GBP and pay for the education of 2 children over the coming year. The two Pauls were inspired to recreate the battle after visiting Belgium for the 200th anniversary of the Battle of Waterloo in 2015, where 6000 re-enactors took part in a spectacular display. Paul Dawson says: We ran the game in York last year (When Napoleon rewrote history and won!) and were overwhelmed by the number of visitors and the £300.00 GBP we raised for Bright Future Foundation. The game took almost three years to plan and is just for fun. But on the serious side, we know we can also make a big difference to a couple of children in Malawi with potentially positive life changing consequences for them." Sounds like a great cause! Best of luck! Suggestion. Take her with you. Stop off in Bettys for breakfast. "Listen Pet, you go to Hobbs or Coast or any posh dress shop in York, I'll just take a stroll"…..straight back to Marygate Carpark where we are already parked anyway. OK then…….."We'll meet for a nice lunch in The Ivy, back next to Bettys". This will be an expensive trip to York but you will be well favoured…..and she will leave no wiser about Waterloo. Let me push this back to the top. Ethically you could not. I am sure you have far too much integrity. This then is not just a really interesting spectacle…it is also helping a good cause. The tragedy is that Malawi's problems have only increased (massively) this week, with her flooding, also hitting her two neighbours. It was well worth today's morning visit and I even managed to drag my wife in towards the later afternoon. DoW was keeping a very steady nerve as we left. Outflanked on his right with Hougoumont bypassed. d'Erlon on the verge of a breakthrough left on centre and nota Prussian in sight yet. I predicted a total collapse with two hours of the game starting, but somehow they are hanging on. If you are anywhere near York tomorrow (and it is always a "Grand Day Out" anyway) you will get a great welcome. Thanks to all for the hospitality! Here is the final round up of the battle. I thought the players may like a debrief so that if they wish to apply to participate in large games again they could use the info provided. All names have been removed to protect the innocent. We raised £200.00 GBP for Malawi too which funds 2 children at secondary school for a year. So, many thanks to all who supported us. The French left sweep round Hougomont caused all sorts of early problems for the Allies on their right flank. Wellington chose to bring the reserve Belgians onto the field in the early minutes. Clearly his erstwhile allies weren't impressed as the division lasted barely 45 minutes before it began the quick trot back to Brussels. Unfortunately for the French, Reille faced a wily opponent in Hill and the expected collapse of the British right flank never did materialise at any point in the day. Hougomont was evacuated and by 6pm no British troops were left on the right flank having been decimated. The Nassau brigade stood fast though. On the British left D'Erlon's attack was ably supported by Milhaud. I Corps and the cavalry swept over the hedges without being repulsed. Fighting went on all day on the crest of the hill and into the British positions. At 5pm Wellington flung in the Brunswick division to hold the flank but like the Belgian reserves, the Germans were heading for Brussels within 45 minutes too – leaving the British left flank defeated and exposed. The centre saw little action until early afternoon when Ney led the cream of the French heavy cavalry up onto the ridge to punch a hole in the depleted British lines. The ridge was held by the British artillery and had little infantry or cavalry support to hold up any French breakthrough. Somerset decided that the Household cavalry was best used charging down the Charleroi Road into the retreating French Cuirassiers. Despite Ney's best efforts, the British artillery held fast and the French were sent packing with many casualties. As this situation developed Napoleon saw that committing the guard cavalry into the mix alongside the Middle Guard would burst through the thin British lines and win the day. The British forlorn hope of Guard cavalry was soon swept aside, but repeated Guard cavalry charges against squares on the ridge line failed to make any impression on the British. The Middle Guard were hampered in their advance by the masses of French cavalry ahead of them. By 4pm Prussians were sweeping towards Plancenoit and by 6pm a Prussian corps was about to overwhelmeLobau and the Young Guard and send reinforcements to Wellington. Fortunately for the French, D'Erlon's corps, despite taking a heavy pounding, helped Milhaud sweep the British left flank away. With 6pm fast approaching the British allied troops realised there were actually no British left on the field. Flinging down their arms, the cries of Vive La France echoed from both lines of remaining troops. Just like my first marriage, the British started with high hopes and expectations. As things progressed, events became increasingly disappointing until at the end there was only disillusionment and bitter recriminations. Just like my second marriage, things looked rosy at the start, with a happy ending in sight early on. Halfway through matters were in the balance but hopes remained optimistic. By the end, half the participants were delighted but the other half felt slightly frustrated and annoyed that their contribution had not been sufficiently recognised. For someone used to hacking into other people's emails for a living you would have thought intercepting a few of Napoleons orders would have been a simple matter. Many people would say that making' no decision' is worse than making a ‘bad decision'. History will judge whether that is the case. Hindsight may wish to consider the commitment of the Belgian reserves by noon and the unsupported charge of the Guard Brigade down and past Le Haye Saint. However, Wellington did give clear, strong and relatively stable leadership throughout the battle. I and am sure he believes he did the best job that could be done in the circumstances, using the hand that he had been dealt. Played like a man enjoying retirement. – with too much time on his hands. Therefore when early collapse looked imminent there was no day job to rush back to. His stickability meant the French were frustrated for over six hours of battle time and 15 hours of real time. Without this stern resistance the French would have been in Brussels for tiffin. When you need to fix a leaking roof you call a handyman. When you need some shelves putting up, you call a handy man. When you need the centre of your army to stand firm against the enemy, you need a general with a solid nerve and resolve. Uxbridge maintained a determined attitude throughout the battle. The Roundhead characteristics of fortitude and steadfastness were on show throughout. Unfortunately deep down inside there is clearly a cavalier trying to find its way out. ‘Hurrah and away we go on a dashing cavalry charge to Glory.' As the last reserves of British Guard cavalry charged to their doom so the hopes of the British army were swept away forever. If you want a three inch deep Axeminster carpet in your living room, it's no good paying for a foam backed piece of felt and expecting it to do the same job. There were not many generals on the field today who managed to lose every single one of the troops under their command. The Prince plugged away gainfully throughout the day, but the wear and tear began to show almost as soon as the battle commenced. His lifetime guarantee to Wellington looks a bit thin now! His attempts to deliver a Prussian breakthrough were much better handled. But like a carpet fitter turning up a day early when the carpets haven't been delivered, his attempts to do the right thing were pointless and futile. For someone who works in a sweet factory you would think Napoleon knows what it is like to try prise open a tin of Quality Streets the day after you have just cut your nails… blooming difficult and hurts the end of your fingers. So sending his Guard cavalry through hedges to charge into enemy squares did seem rather a tad optimistic. His ailements gave Ney a chance to shine but the working relationship between the two never seemed to quite form into the perfect partnership. Maybe taking an afternoon nap at La Belle Alliance wasn't such a good idea after all. For the French to win the day they needed their commander to show flare, vision and charisma. When the universities come to write their academic books about the battle there will be much debate. Whilst he had all resources in place, operationally he was the only commander on the French side to lose all his troops, Ney put great faith in cavalry breaking though entrenched hill top positions, However, history will also show that any commander who brings resources such as wine, port and Armagnac for his fellow operational commanders to enjoy deserves a modicum of success (Wellington please note). For a man of vision, Reille's future looked very rosy at noon. Rose tinted spectacles were not needed to foresee a French victory in under an hour on their left flank. Expectations of victory proved short sighted though as his brilliant early gains were fritted away in increasingly desperate attacks. The occupation of Huogoment was balanced by the loss of all Reille's cavalry support by early afternoon. 40 years of working in the rail industry seems to have sucked any joy out of D'Erlon. His corp's victorious charge over the hedges and across the sunken road were greeted with his utterances of deep sighs and expletives. Handled his cavalry in support of the infantry attack with surgical precision. If you ever need your leg amputating you need to employ a chap who can not only tell his left from right but also has the coolness to ensure he makes the right decision under pressure..
Happily for the French, Milhaud delivered his incisions to perfection and with perfect timing. He coupled this with an uncanny knack to roll 6s at just the right time too. Certainly I saw many taken. Great write up. Nice write up, I was talking to one of the Allied generals at Oxford WGC on Monday night. He enjoyed the game and it would be good to see some photos. 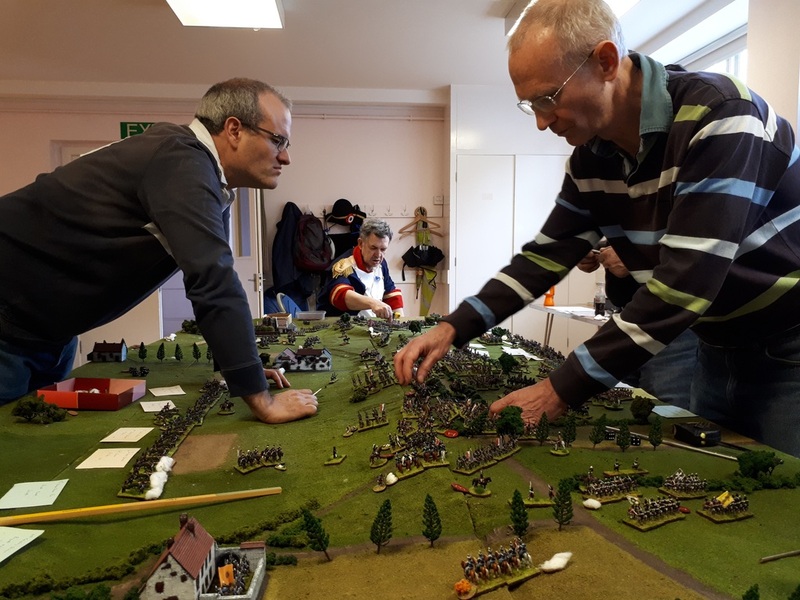 not sure how the technology works on here to place photos.. we have put lots on the napoleonic wargamer facebook page. any suggestions how to get pics on here? Happy to post them for you. liamdotfloodatnhsdotnet…..you can work that out I am sure but the robots cannot…. Just this morning got three photos e mailed to me. Seems there are far more on line but I do not have the link. I have requested they post it here. Nice, glad you got them linked. Look I am Internet-not-savvy…by a long chalk. I am a fan of a band whose members are almost all dead, some due to old age indeed. The whole problem is actually no link as yet. Relying on the organisers, who I suspect are of the Hawkwind (early days) generation to offer such. not internet savvy? how dare you!! my phone also does texts so am not completely a luddite. The issue is we dont have a blog or web page.. as we dont really have a need for one. The napoleonic wargamer page on the face book has the pics. Deadhead's help has been much appreciated. If the 21st Century means "likes" by the "celebrities" that adorn those weird magazines by the supermarket checkout, if it means you must have a thing on your wrist to tell you that you are running at reasonable rate, if the high street is wiped out by delivery vans for on line shoppers..